**This blog post contains affiliate links. This means if you click them and make a purchase, I will get a small commission. It doesn’t change a thing for you and it helps me run this blog! I purchased this course a year ago and worked through the first few lessons. Honestly I got distracted and never finished but I recently pulled up the class and started going through it again. It has been such a blessing. Life is drastically different now that it was a year ago. So I need to take a close look at my goals and “Big Rocks” in life. 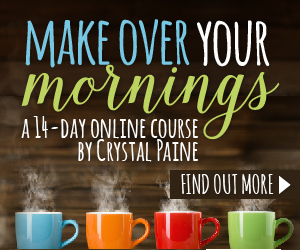 As a user of Make Over Your Mornings(MOYM) I wanted to give an honest review of this 14 day course. I would never promote a product that wouldn't benefit my readers or that I wasn't 100% behind. That's why I had to share about how this course has benefited my life. Truly it is helping me to make my mornings AWESOME! But in the spirit of disclosure I am an affiliate for MOYM and I receive a small commission from any purchase that you might make. Each lesson is short but PACKED with wisdom. There are two parts to each lesson. First there is a video where Crystal shares her method for finding more time and energy to do the things that truly matter. Second there is a PDF download with more information, links and worksheets that help you to implement each lesson in your life. This course isn’t just about getting things done, although that is a side benefit. It is helping me to order my time so that I can do the things that truly are most important. I think it will help you too! For the past 20ish years my schedule has looked basically the same. Homeschool in the morning. Eat lunch. Then more school in the afternoon unless we are running errands. Activities were in the evenings. Everyone in the family knew what to expect. Now I only have one child to homeschool this year. It's exciting. It's scary. It’s not an ending but a beginning. I’m ready for this phase of life but it is so DIFFERENT. So how do I figure out what is most important? I’m taking my own advice and looking closely at how to budget my time and resources as I work through Make Over Your Mornings. The beginning of the school year is the perfect time to change things up. September 1 is a little like January 1. It’s a fresh start where we can make goals and pick priorities. I admit it. I like to check things off my to do list. Yes sometimes I write things down after they are done so I can cross it off (It’s a sickness). That doesn’t mean I get the MOST important things done! What are my non-negotiables? This course helps nail them down. I've learned that I need the kitchen cleaned up the night before so that my mind is clear when I start the day. If I have to do dishes first thing—well it doesn’t put me in a good mood. It makes me grouchy from the start. Sleep. My minimum is about 6.5 hours of sleep. And at least 1 of those hours needs to be before midnight. This is hard. I have turned into a morning person. I don’t know how to go to bed on time. I love the peaceful quiet house after everyone is in bed. But I’ve learned that I’m sharper and able to do more if I sleep and have those quiet hours early before my family is up. So to make my morning awesome I need to turn everything off and be asleep by 11. If I do these two things then each day has the best shot of being really good! If you haven't watched the following video about the "big rocks" in life, then stop for a minute and go watch it. I'm re-evaluating my big rocks and I've found that they haven't changed. What the day to day looks like is different but the important things are the same. Well not really. I'm up regardless because my body just wakes up but I DO need a reason to be happy about getting up early. I'm not a morning person. Never have been. But as I said earlier, I LOVE the quiet house and the early morning hours are so peaceful. It is a quiet reward for being up and out of bed. Another reason to be happy about being up is that I get so much more done in the morning because my brain is sharper. 5. My stress is lower if I have goals. Have you ever noticed that if you don't have a plan then you run in circles trying to give yourself some direction. I find this is true for everyday and even for a lifetime. MOYM has helped me find direction for my mornings. By breaking my goals into bite size pieces then life is challenging but I can see progress being made. That brings peace instead of stress. Goals give me permission to choose when NOT to work so I can find time to breathe and enjoy my life. These 5 lessons (from the first five days) are just a small taste of Make Over Your Mornings(MOYM). I highly recommend this 14 day course because it truly has helped me chart a better course for our school year and for my life! I can't wait to do days 6-14! Want to join me and thousands of others who are doing the course for back to school help? I hope you do! Get your copy of Make Over Your Mornings(MOYM) and jump right in. If you need a little more encouragement, there is a wonderful Facebook group for those working though Make over your Mornings! Make sure that you join in!